Well, we found an RV that we couldn’t resist. 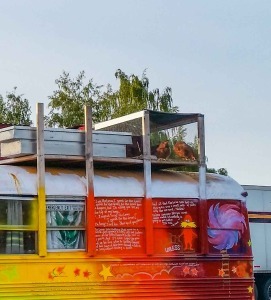 We followed the RV to a rest stop in Oregon and found that it was for sale! It had more mileage than we wished but it made up for the miles with outstanding new features. First, it is brightly painted with high visibility (HI-VIS) colors to aid in road recognition and thus safety. Second, the new RV has ample length and comes with a superb roof storage area complete with a roof mounted vented propane system. 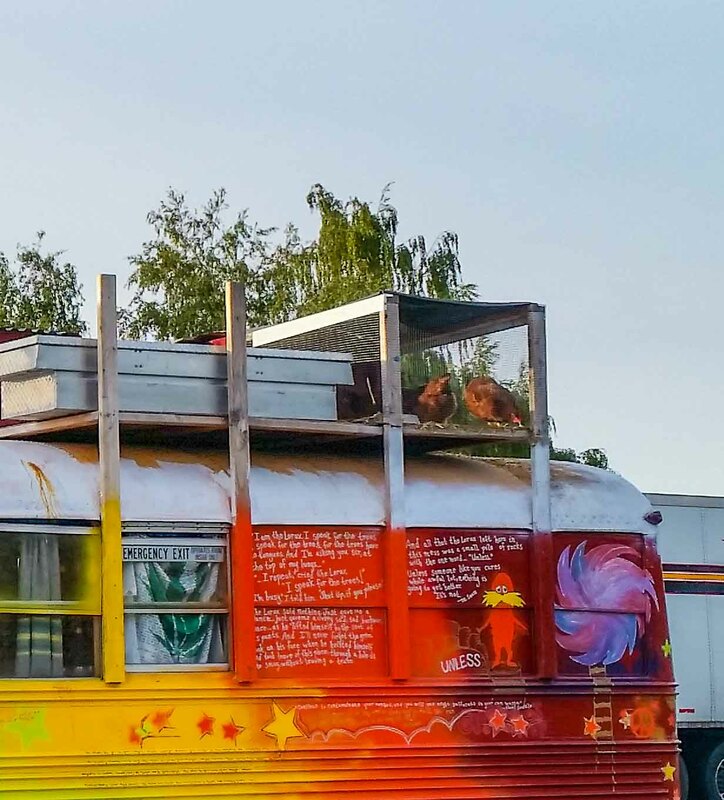 The most intriguing aspect of the roof is the rear deck with an onboard functional hen-house with six hens up there enjoying the view at more than 60 MPH. You don’t find THAT feature at many RV shows do you now? (the hen house is usually a major, major upgrade) The hens do have a completely enclosed and protected shelter available for high speed maneuvers and frigid conditions if they are having any trouble walking on the deck. When the vehicle is stopped the hens are able to feed on a rear deck exercise area from an auto feeder and auto water source. The current owner told us that the hens have a heck of a time trying to peck at those corn pieces at 60 MPH so he must slow down or stop and activate the feeder or they will get “sickly”. Owning this technical masterpiece means that Bonny and I will no longer have to rely on KFC for sustenance during our travels! Just a quick trip up that rear ladder and dinner is ready – scrambled eggs or …? Talk about true freedom and living off the grid! I need a hair cut and a pedicure…….My electric toothbrush has died….I am out of clean underwear…..it is time to return to Redding. Oh did I mention, it is raining? I don’t particularly enjoy outdoor exploring in the rain. We are at Seven Feather’s RV Resort on the I-5 North of Medford. It’s claim is that it wants to be the best RV Park in Oregon. It is connected to the Seven Feathers Casino and is run by the Cal Creek Band of Umpqua Indian Tribe. So far I am impressed. When we arrived (in the dark) we were escorted to our site by a guy in a golf cart ( gratuities appreciated). The cost per night is $36. We have found that our cost per night on this adventure has been in the $20-30 range. We have just decided to stay for the day and explore when the rain lets up, make a pot of soup, cozy up and read. Coincidently The Bucket List is on the TV. Doug and I have been on the road together in approximately 400sq. feet for a little over 3 weeks. He is very easy to get along with. There is a definite division of labor. He does everything on the outside and I do everything on the inside. One of the things I made very clear before we ventured out was that I absolutely could not live for long in a messy coach. For those of you that know Doug, I am not exaggerating when I say, Messy is his middle name. He has blown me away with the pride he takes in the coach. Wonders never cease!!!! The cupboards are organized and the wood is polished. One of my goals on this trip was to learn how to cook in a combination microwave/convection oven. The microwave broke shortly after we left and one burner on the stove just doesn’t seem to want to turn on. I have actually done quite well with one burner and a bar-b-q. Every where I go, I think it is the best. I think of the kids and grandkids and how much they would enjoy each place. One of the acquisitions Doug has made this time around is a little round thing that I thought was a white covered bar-b-q. It turns out to be a satellite dish with much newer technology than our 10 year old RV has. On this trip we are returning much less news depleted. At this time in the news we are 3 weeks from the mid-term elections. There are 3 cases of Ebola in the US. The nurse that contracted Ebola graduated 4 years ago and has worked in Critical Care and is one of 70 people that had cared for Mr. Duncan, the first to die of Ebola in the US. Leon Panetta has just released his book. BO still stands firmly on “no boots on the ground” as ISSIL moves in on Baghdad. I am learning that there are about four different kinds of camp sites….at least those in Oregon. The first is the state or county parks with gravel pads, lots of trees, sometimes grass, a well worn picnic table, and a REAL fire pit…….places that make you want to hang out at your campsite. The next have little or no trees, concrete or asphalt pads, very clean with laundry facilities, not much character but reasonably priced and put you near a city or attraction you want to spend the majority of your time. For me that would be Portland Fairview RV Park. The third are very very nice “resorts” with flowers and all the amenities with very strict rules and no children or fire pits in site. Many of these places only allow class A or C rigs of a certain age (Pacific Shores RV Resort). Perhaps the price and word “Resort” are the clues. The last are simply “parking lots” like the Walla Walla Elks or Whisky Town at Oak Bottom. This Seven Feathers might just be the best of everything……we will see when it stops raining. As this trip comes to an end, we are talking about our next outing. We are thinking of starting at Quartzite in Arizona which is a meeting of about 20,000 folks with Tiffin RVs. This is on BLM land and is completely “dry” camping. Waste is trucked out and Water is trucked in. We were thinking it would be a good starting point in January for a tour of the South West ending with a visit with Matt in Dallas, Texas. I have never set foot in Texas.